If you haven’t already, be sure to check out Heart of the Matter Online’s January digital magazine: “Focus on Science”. Great articles in the magazine! My favorite one is on Catapults and Trebuchets. Very cool. 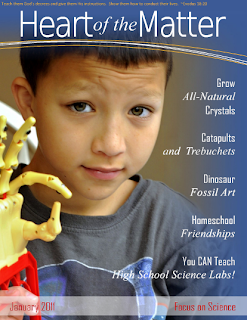 And Pssst!… Castle Heights Press has an article on page 34, with a coupon code at the top for 15% off your purchase! Pair this with the One Week Off unit study sale on right now, and you have quite a deal!